The Abercorn Chalet is tucked within a valley in the Eastern Townships, a scenic region in southeastern Quebec. 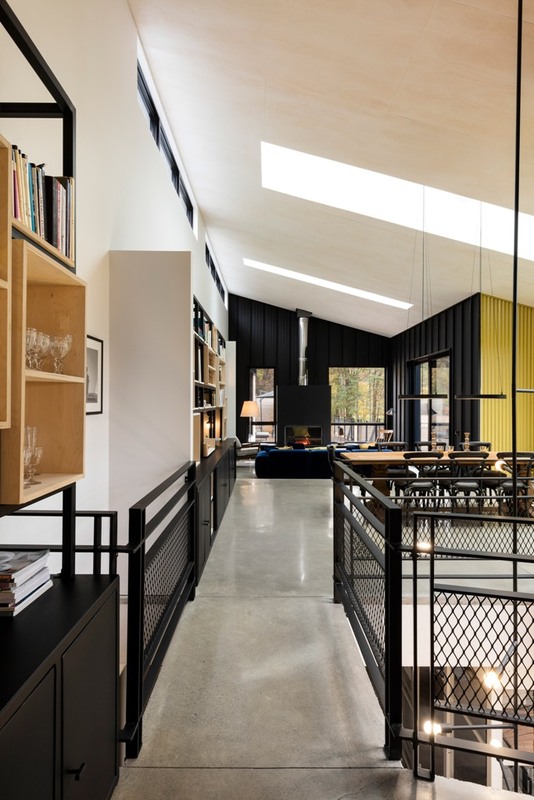 The holiday home sits on a wooded site with a pond and a swimming pool. 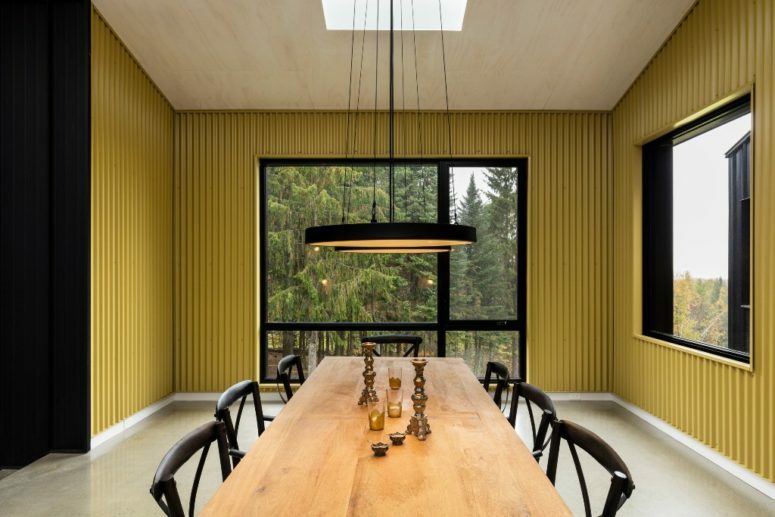 The project was designed by interdisciplinary studio Tux Creative in collaboration with architect Guillaume Kukucka. The goal was to create a dwelling with open spaces, cozy nooks and an embrace of the natural setting. The designers took cues from several sources, including traditional farms, suspense novels and drawings by Dutch artist MC Escher. The house comprises interconnected forms that stretch across a sloped site. The sprawling building has various cuts and extrusions, along with a mix of sloped and flat roofs – resulting in a highly irregular composition. On both ends of the home, spacious decks are lifted above the ground by metal columns. 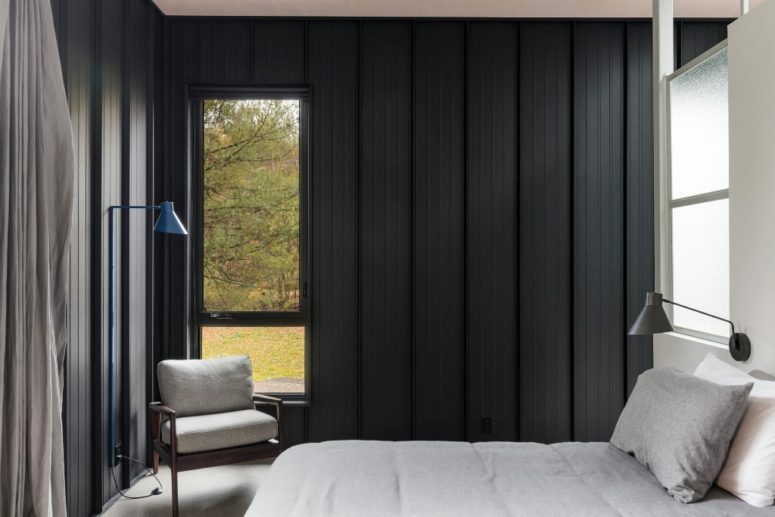 For exterior walls, the team used contrasting materials – black metal and light-toned wood. 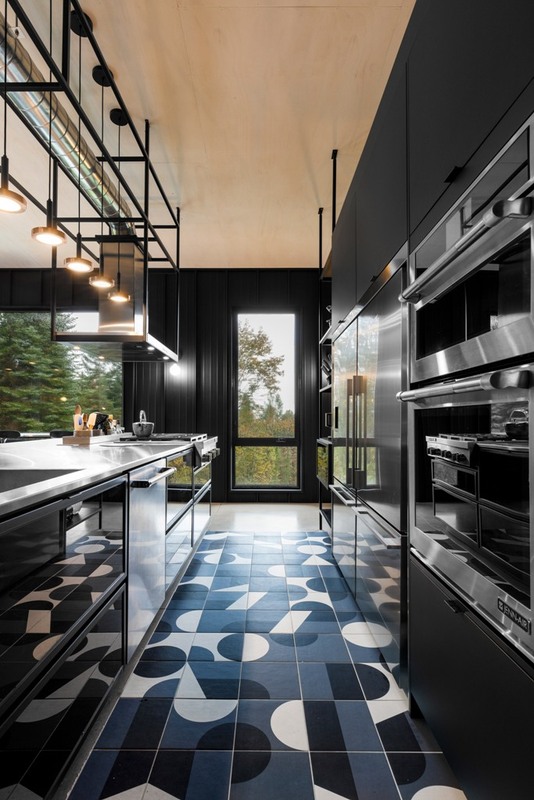 The industrial aesthetic continues indoors. 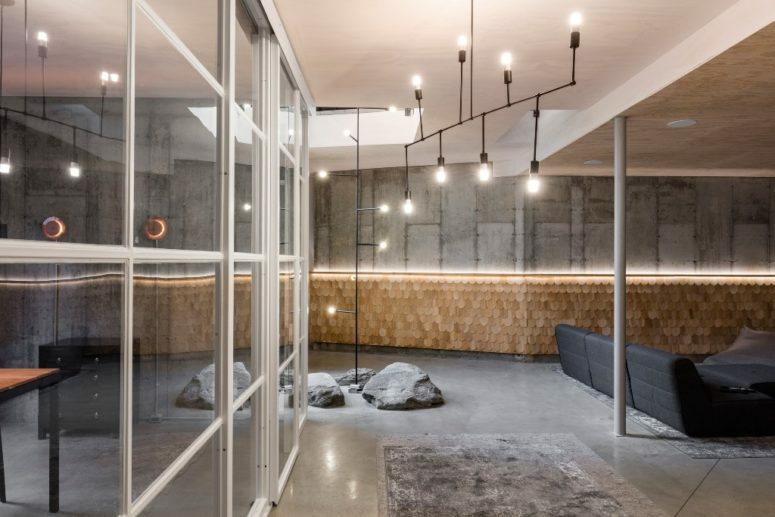 Smooth concrete flooring is paired with different types of wall treatments, ranging from raw concrete to plywood panels and corrugated metal. 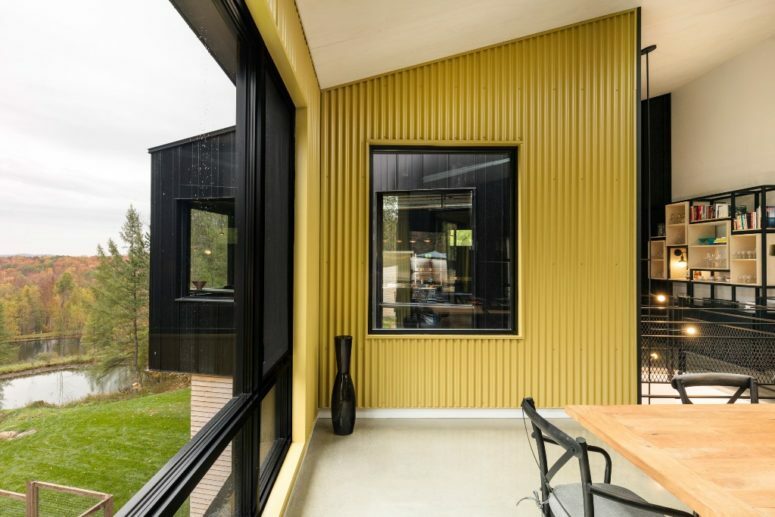 The interior use of traditional exterior cladding – like corrugated or profiled sheet metal painted black or gold – disrupts reference points and induces a sensation of being outside. 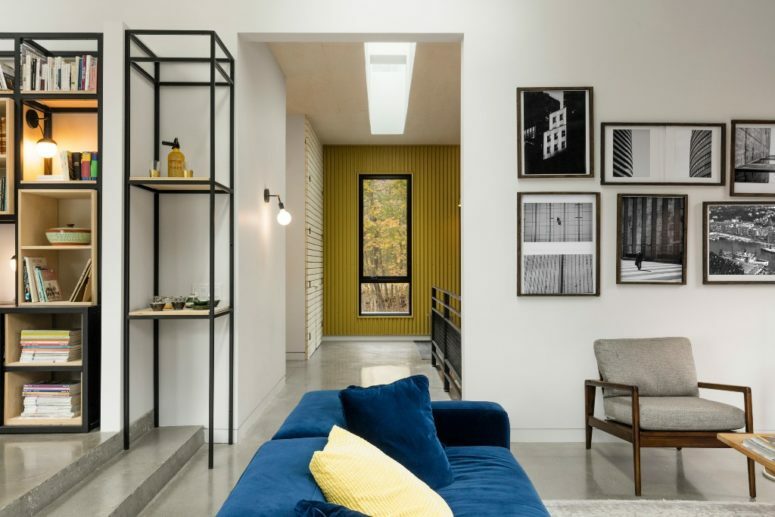 Throughout the dwelling, large windows usher in natural light while also providing views of the surrounding landscape and other parts of the home. 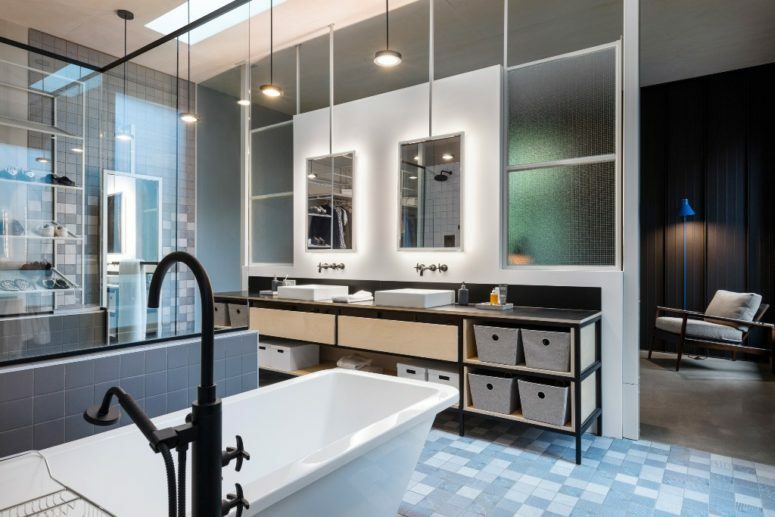 Additional illumination is provided by carefully positioned skylights. A fluid layout provides moments of suspense and discovery. Door heights vary – one bedroom door rises six feet (1.8 metres), while another rises 11 feet (3.4 metres). Contemporary decor is incorporated throughout the dwelling, with vintage pieces used in select areas. While the home has a cohesive appearance, each room is intended to have a distinct personality.